Renee – You know me…I’m not much of a shopper, but I do it once a year. I have one word for you: Goodwill (or other store affiliated with a charitable organization). Shop there (especially one in a nice neighborhood) and you get a two- or three-fer. Your purchase is a donation to Goodwill, you have found a bargain, and when you get tired of the outfit, you can re-donate it. When it’s in a high-end area, you may find nice designer clothes that were never worn and still have the tags on. What I’ll do is buy something, then try it on when I get home and if I don’t like it, it goes in the Goodwill bag for my next visit. Mary Anne, I have shopped Goodwill, we have right down the street. Love this, Renee!! It’s so true! Since we lived so close, we may have been on that bus together!! 🙂 LOVED the one & only Tea Room. There has been nothing like it since. Thank you for the wonderful memories & that adorable picture of the three of you! Glad you liked it Dinah!! I can’t find the words to tell you how much I love that photograph! I’m not a big fan of shopping, but my mom is. Always has been. She converted my old bedroom into a giant closet. I’m pretty sure she goes in there and pets her sweaters. Lorie, glad you liked it…and love the comment about your Mom petting her sweaters.. Yes, it was Susie! LOL! Glad you liked it…thank you so much! This is your best blog topic so far! I certainly can relate to each and every point! I too love to shop and learned from my Grandma Elsie at an early age. She was always welcomed by the sales ladies at Jack’s and Bear’s and Sitler’s Millinery. She was a very good customer and looking back those ladies were good at “sucking up”! I noticed that you have ‘friends’ that ‘shop the box ‘!! So please put me in touch with the other Box Shoppers so we can unite!! Bahaha!! I just got one today and I haven’t had time to peek inside at my ‘treasures’ . FYI , I never received a whole outfit in one box. From MY input, it’s up to my stylist to build a wardrobe from my input and feedback. I was just about to ‘drop the box’ when the next one I got was awesome. So, for now, I’m still hooked! I still like to shop but haven’t had much time. Summer is just so busy with golf, gardening and pool parties. I think in the Fall when I have two half days all to myself I will explore the stores once again and share my bargin finds with you. Of course before you know it I’ll be Christmas Shopping time and that’s a huge task with my big family! house to be built and then furnished it and then had to buy whole new wardrobes!! I wasn’t so much into needing a ‘FIX’ after that! 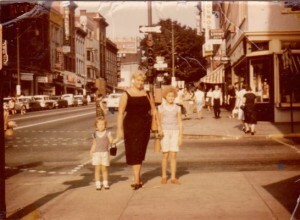 I do miss Downtown York of the 50’s & 60’s. 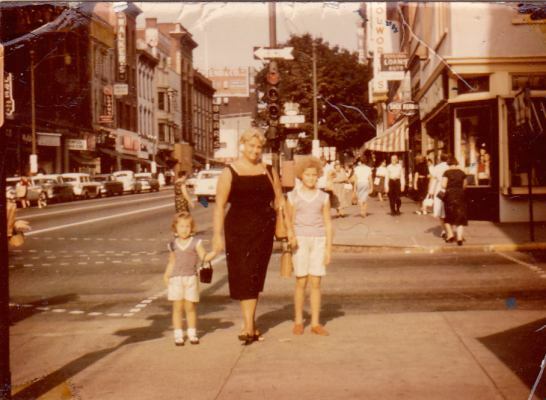 I have so many good memories of riding the bus into town with a girlfriend or going shopping and doing lunch at the Tea Room with my Grandma, Great Aunt and Second Cousin. Thanks Renee for the thoughts and the memories! You are so welcome Joanie! Thank you for reading and your comments…We will have to go shopping some time in the fall.. Yes, you are but I was impressed with you not buying anything during your visit to Vt! I don’t shop that much anymore mostly because the stores are so far away and it’s not as convenient. My new addiction is selling things because just like buying a good find….I love a good sale! I am also addicted to buying things on Craigslist and getting good free stuff which there’s a lot of up here! I learned from the best bargain shoppers a girl could have…you and Grandma! Lol!